Avril changed up the setlist tonight in Yokohama and added "17" and "Hush Hush"! While it means taking "Don't Tell Me" and "Wish You Were Here" away (while there really is no reason that these couldn't also be there), we are still happy that she is listening to us and adding new songs. Check out these small clips of Avril singing "Bad Girl" and "Hello Kitty" in Tokyo and Osaka! Avril Lavigne kicked off her world tour tonight in Osaka, Japan, and the setlist has been released. Die hard fans (like us) are going to be disappointed in the lack of new songs on the setlist. It features all of her singles from past albums, with Hello Kitty and Bad Girl thrown in as well. I would assume that Hello Kitty will be only for the Japanese leg of the tour. No videos yet, but take a look at the setlist and comment with your thoughts. Avril is featured on the cover of Japan's SPA! Magazine for February. She kicks off her world tour in Osaka on January 31. Avril recently did a photo shoot for The Hollywood Reporter, as well as a short "interview" which you can read here. Avril is the spokesperson for China's Uni-President Iced Tea, and is back with a new 2014 campaign! See below for new pictures, and expect a new commercial soon! Avril's China tour for February and March is now on sale. See the sidebar for dates and information on tickets. Still no other tour dates have been announced. WOW, Avril has been quiet lately. Other than a few tweets to fans here and there, we haven't seen or heard from her at all this year. I would assume she's busy preparing for the tour that begins on January 31 in Japan. No word on any other dates, but I think we can expect something soon. I will be going on holiday, so no updates until after January 18. 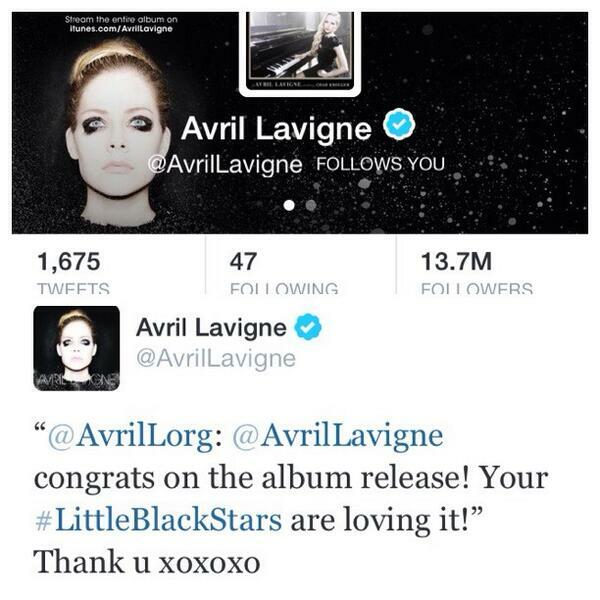 Avril has had an amazing year. From getting married to Chad Kroeger, releasing the best album of her career, making epic music videos, starting her world tour, having fan participation contests, and just being an overall awesome person, what has been your favorite 2013 memory of Avril? My favorite part would be when Avril finally acknowledged Avril-L.org and followed me, replied to me multiple times and RT'd me on Twitter. She truly loves her fans and if you want this too, don't be discouraged. Keep tweeting her because she does see everything! Avril has added new tour dates. The world tour will now start January 31 in Osaka, Japan. Other new dates are February 1 in Tokyo, February 19 in Seoul, South Korea and various dates across China in February and March. See all current tour dates in the right sidebar. AvrilLavigne.com has removed Avril's February 11 show in Bangkok but tickets appear to still be on sale for this date. Also, the March 14 show in Taipei, Taiwan, now shows as Kuala Lumpur, Malaysia on the website.